It is thought that the bass trombone first came into any significant position in a big band when Stan Kenton hired Bart Varsalona. 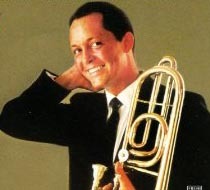 Bart came into the band as a tenor trombone player but in an article in the International Trombone Association’s Journal, The Trombones In The Orchestras Of Stan Kenton, Paul Bauer says that apparently Bart was on tour with the band in San Francisco when he saw a bass trombone in a shop window. ‘I had an idea,’ Bart said. ‘The band was playing a lot of heavy bottom. I went in and tried it out. It felt pretty comfortable and the price was right. I picked it up, and brought it in on the job that night. [Kenton] saw the difference immediately. He said: “Great, keep it”’. So it is possible that the bass trombone was first used in a big band, Kenton’s, in 1943. Here is a ‘Soundie’ of the Kenton Orchestra circa 1945 playing Southern Scandal with the double bass, baritone sax and bass trombone (probably Bart Varsalona) lined up one behind the other. Varsalona worked with Kenton for eight years. After he left, his place was eventually taken by George Roberts who had been playing tenor trombone in Gene Krupa’s band. George Roberts is still looked on as one of the masters of the instrument. In Elicia Hill’s article in the ITA Journal, Roberts began exploring the role of the bass trombone, thinking: ‘Nobody has ever played a solo on bass trombone, and I could really take advantage of my [lower register]. It [will] be harder because of the pacing against the tenor, and there are more restrictions. Bass trombone is like playing an open inner tube. I’ll have to pace myself differently. I’ll go more for sound. Maybe I could play songs like Urbie [Green] only an octave lower’. (George Roberts died in California in 2014 at the age of 86). Sam Freeman remembers hearing the 1959 album that perhaps most highlights George Roberts’s instrument, Meet Mr Roberts. Here is My Romance from the album. 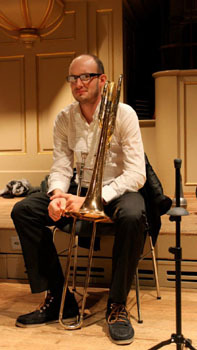 Sam Freeman plays bass trombone, contrabass trombone and sackbutt. 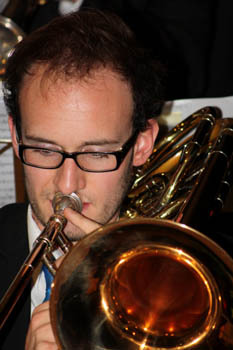 Much of his work is with classical orchestras – the BBC Concert Orchestra, BBC Symphony Orchestra, Philarmonia Orchestra, English National Opera (to name but a few) – but he also plays bass trombone in the London City Big Band, Pandora’s Jukebox, the Diamond Skyline Orchestra and for West End shows. Sam and his older brother, Dougie (an excellent jazz pianist), grew up in Nottinghamshire. Their father was a piano teacher, taking students for classical music lessons but with a love for Boogie Woogie. ‘There was plenty of music around at home,’ says Sam. ‘Mum sang, but not professionally, and Dougie started to play the piano early. The changes came when we moved to join the Southwell Minster choir. I think it was there that I first became really aware of harmony. The choir members were offered the opportunity of free instrument lessons and I chose the trombone. We were both very lucky that our state secondary school was very encouraging of music. There were lots of opportunities around and as a by-product of the Minster choir, there were a lot of good young musicians. In 2008, Sam went to the Royal Academy of Music on a full scholarship and then with a Leverhulme Scholarship, continued at the Academy until 2013. Along the way he won a Mark Elliott Scholarship, the Christopher Horn Award, awards from the Wolfson Fund and the Craxton Memorial Fund and a Highly Commended award at the RAM’s John Soloman Prize. Sam and Dougie both play regularly with the excellent London City Big Band at the Spice Of Life in London. Here they are playing September In the Rain. Frank Sinatra singing I've Got You Under My Skin with the Nelson Riddle Orchestra from the album Songs For Swinging Lovers. Sam has also taken the bass trombone into other scenarios in playing with Pandora’s Jukebox and the Diamond Skyline Orchestra. The Diamond Skyline Orchestra is a showband playing for weddings, parties, corporate events, etc. In both, the bass trombone adds to the textural range the band is able to produce. Here's a video of Sam playing with the Diamond Skyline Orchestra including several members of the London City Big Band. Pandora’s Jukebox is primarily a function band with both Dougie and Sam Freeman in its 8+ piece combination. 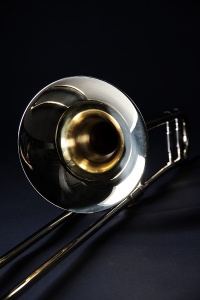 For many listeners, the bass trombone might well go unnoticed on a big band recording – but listen carefully, you would notice if it were not there!